Everyone knows what the northeast corner of Main and Calhoun streets looks like today: that's where the City-County Building is located. But as these two pictures prove, the corner used to look different - a lot different. The top photograph was taken in the 1890s and shows a bustling, frontier-era Fort Wayne. A horse-drawn wagon is stopped in front of a clothing store. Next door are a newspaper office and a saloon. An early trolley car rumbles down Main Street. The bottom picture (editor's note; so far, photo not available, but we're still looking for it) shows a city in transition. Many of the same buildings are still visible, although considerably altered. Riegel's Pipe and Tobacco store is on the corner, next to a loan shop and the Royal Tavern. Overhead streetcar wires above ``the transfer corner'' attest to the popularity of mass transit in those days. The bottom photograph was taken in the mid 1960s before work began on the City-County Building. 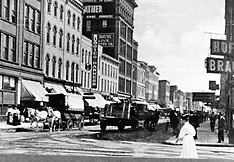 The view was typical of most of downtown Fort Wayne in those days, as the city was filled with canal-era buildings attempting to perform 20th century functions. Note the buildings which extend down the north side of Main Street. Those buildings were all torn down, replaced by Freimann Square and the Performing Arts Center. When the City-County Building, the park and the arts center were built, 24 acres of old buildings were torn down, taking with them the flavor of old Fort Wayne. The razing of these old buildings and the 1971 completion of the City-County Building were a study in downtown Fort Wayne in microcosm, as throughout the downtown area in the 1960s and 1970s old commercial buildings were replaced by new governmental and banking buildings.